Singapore will be added to the OECD’s list of non-cooperative tax centers (money haven) by the Organization for Economic Cooperation and Development (OECD). The OECD estimates that Singapore has 370 billion dollars in money haven deposits. Singapore is not just a haven for money launderers and tax cheats; it is an extradition-free country for crooks from nearby countries. Singapore avoids extradition treaties with its neighboring countries, so that regional crooks can flee to Singapore – bringing their money. The fact that Singapore does not extradite from its neighbors is illustrated by Singapore’s famous bond trader Nick Leeson whose US$1.3 billion loses caused the collapse of Barings Bank. To avoid prosecution, Leeson and his wife decided to flee Singapore. They left their luxury Singapore apartment on Friday, February 1995, crossed the border into Malaysia and checked into a hotel in Kuala Lumpur. Twelve hours later, the Leesons traveled to Kota Kinabalu, a Malaysian resort 750 miles northeast of Singapore, where they enjoyed themselves until Wednesday. On Wednesday morning they flew to Brunei. There, they spent the day in the airport’s departure lounge, and that evening boarded Royal Brunei Airlines Flight 535 for Frankfurt. The Leesons were at large, and tracked by Singapore for five full days in Malaysia and Brunei – neighboring countries. No attempt was made by Singapore to extradite Nick Leeson, until he reached Frankfurt, Germany. Indonesian Defense Minister Sudarsono accused Singapore this year of not signing an extradition pact with Indonesia for fear it would be obliged to return money stashed away by corrupt fugitives who had fled to Singapore. “Singapore doesn’t want this extradition arrangement because it would have to return money from corrupt individuals who ran from Indonesia, along with the hot money it gets from other countries,” Sudarsono said. He estimated there were 80 Indonesian fugitives living in Singapore. When he met with Singapore’s senior minister Lee Kuan Yew in Jakarta last year, the city state’s founder stated that it did not make any sense to return the money. When questioned about the extradition treaty with Indonesia, Singapore Foreign Minister George Yeo said, “We set aside the issues for the time being.” George Yeo recently visited Washington, where he was honored by Hillary Clinton. Indonesian billionaire fugitive, Liem Tek Siong, alias Sjamsul Nursalim, alias Liem Tjoen Ho, Liem now lives happily in Singapore. Liem owes US$2.8 billion due to the collapse of his Indonesian bank. Free in Singapore, Liem is heavy into the country’s real estate business with the help of Singapore lawyer, Helen Yeo (the wife of disgraced former Singapore cabinet member, Yeo Cheow Tong). Another person considering asylum in Singapore is Zimbabwean President Robert Mugabe. On a recent visit to Singapore, Mugabe’s bodyguards roughed up Fredrik Schulte, a member of Sweden’s parliament. 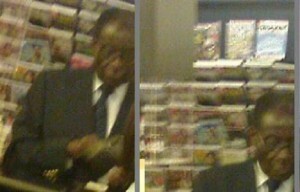 Mugabe was afraid that he might have caught in a photographed taken by Shulte. Singapore is not just a money haven – it is a host to some of the world’s top fugitives. this is a great resource. Thanks. LKY’s sons own properties in Vancouver and Whistler since the 80’s. The families holiday and skii here frequently. Brother-in-law of one of Singapore ex-presidents and his wife who owned a boutique at Mandarin Hotel moved to Vancouver even when her brother was still a president then. Incidentally, Vancouver is Canada’s paradise for drugs and financial fugitives. I know. They bought them through a company called Worldwide Properties. One of my friends was working in this company. they did a lot of sales pitch in Singapore during the early 80’s (including flying expense reimbursements upon completion of purchase). Singapore is not only a haven for tax evaders and world’s top fugitives, it is a the staging post of espionage activities in S.E. & E. Asia. Did anyone actually notice that the embassies/high commission of the US, Great Britain, Australia, and China are all clustered along Napier Road vicinity ? Well, it was not by coincidence but by design that the sites were alotted to them by the Singapore authorities. Furthermore, if you want to be more circumspect, look across Napier Road to the building which previously housed the police station. The structure now has an enclosed fence perimeter with fortified barb wires. Its a covert operations base – for both intelligence gathering (easdropping on them) as well as a headquarters to provide security cover and surveillence on these foreign properties beyond the jurisdiction of our sovereignty. Phillip Jeyeretnam has been appointed a member of the Public Service Commission. From there, Philip Jeyaretnam can give promotions to his fellow countrymen, people like Balldev Naidu who is being extradited to the U.S. This is not a good publicity for Singapore. But if you have your facts, then I salute you for exposing this info. Laura: My facts come straight from the US government. Singapore is full of crooks, and only the poor ones hang.